I didn't realise it that big a positional disconnect. Connacht started him once at 12 and he had 15 starts for Ireland there before he left. When is zebo's contract with R92 up? Peg Leg wrote: When is zebo's contract with R92 up? Question is could we afford a dedicated pastry chef? I will if we are losing Rob K. No top class replacement. Whatever about Zebo's opinion of himself, he'd be a quality addition to our back 3. Playing really well at FB in paris. I think Stu would do wonders with him and Faz would be happy to have him back in the fold. Has he not stated publicly that he would never wear the blue of Leinster? 2021 (he'll be 31) but pretty certain he'd never play for Leinster, and don't think I'd want him, good player and all that he is. Thx. Im probably in the same boat. Zebo is settled in Paris. Our systems might not be to his liking. Next season we will have Kelleher, Larmour, Keenan, Kearney x2 and a few others like Daly who can play there. ronk wrote: Zebo is settled in Paris. Our systems might not be to his liking. That's only 2 specialist players at either end of their careers. The system's point is a funny dig and to the contrary the management might want a bit more individualistic flourish. Look, I doubt we'd ever see Zebo in the blue (of Leinster) but we know he's driven by the green (money), so he is an option. I'm obviously trying to play the provocateur but if you're not looking at all of your options then you're making decisions without all of the information you need. I'd rather get sick than watch Zebo play for Leinster, thankfully it will never happen. Pretty sure he said the other week that he wouldn't play for Leinster if he was offered €5m. mildlyinterested wrote: I'd rather get sick than watch Zebo play for Leinster, thankfully it will never happen. I'm not sure about Kelleher but all the rest are fullbacks first (officially). Leinster have been happy to play 3 fullbacks at once. 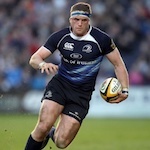 Laighin Break wrote: Pretty sure he said the other week that he wouldn't play for Leinster if he was offered €5m. I dunno why it's even being talked about.